At your wedding, you'll have one job. Being perfect isn't it. I was at the wedding with the butterfly release, when it was too cold outside for the butterflies to wake up so they just fell on the pavement and got trampled. I was at the wedding where the couple arrived late, and then the maid of honor passed out halfway through the outdoor ceremony. Then it rained. I was at the wedding where the bride and groom set up a tent in their backyard and threw a potluck instead of hiring a caterer, except nobody told the guests when they could eat so half of them went through the line and filled their plates during the cocktail hour while the bride and groom were gone somewhere taking photos. They arrived in time for dinner to find dinner had been eaten without them. I went to all those weddings. They were all fantastic. Why? Because in every case, the wedding couple knew their one job. Now it's your turn. You're engaged. 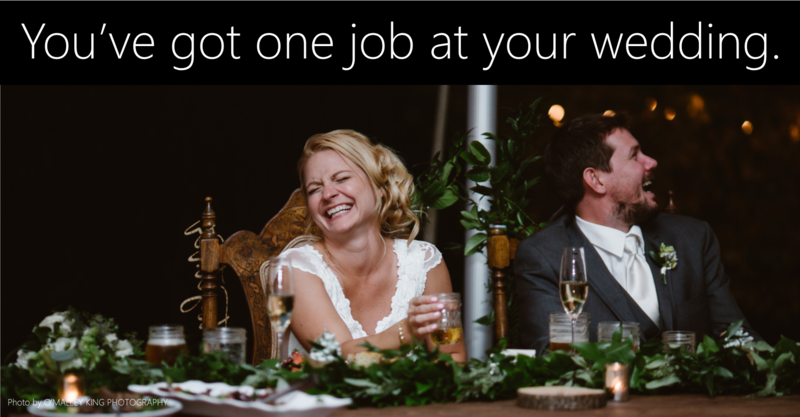 And at your wedding, you will only have one job: You have to play. You have to goof off and have so much fun. For one whole day, you have to smile and kiss and throw your hands up in the air and actually not care. It's really not as easy as it sounds. Right now, and probably for many months to come, you're working on your wedding in a particular kind of way. You're making decisions. You're choosing who you'll trust to make your party work. You're spending money. That's a certain type of play. Planning is fun - at least, it ought to be. You should feel like you're lining dominoes up all over your house: Creating. Imagining. Anticipating. But your wedding day, the day those dominoes go down, is an entirely different kind of play. It's not at all like planning. It requires that you throw caution to the wind and just be present in the moment with the ones you love. So here's your mantra for your wedding day. Repeat it with me: "Whee!" Life's unpredictable. That's just the way it is. So on your wedding day, I hope at least one thing goes wrong. At mine, I almost passed out until I realized my rented tux pants were adjustable and they were cutting off my circulation. I walked right into a candle and spilled wax on my jacket. We found out our marriage license was for the wrong county, so we had to reconvene with our officiant over county lines so he could make the marriage legal without perjuring himself. Everything else was perfect. It was awesome. But guess which stories I love telling now? The foiled potlucks, fainted friends and flaccid butterflies I wrote about above all wound up the same way. At every one of those events, the wedding couple knew their job and nailed it. They just laughed. They kissed. They recognized that flaws are part of beauty, too, and they let the weirdness humanize their wedding days. Then they swigged beer, got out on the dance floor and belted silly songs as loud as possible. Those weddings all were years ago. Which stories do you think they're telling now? Your wedding should be formal, but it should be silly and a little messy too. When we tell this to couples we work with, it usually comes as a relief. Because you knew, instinctively, that it was true. But it's so easy to forget. You have to fight to have fun sometimes. You have to remind yourself - or better yet, remind each other - what your wedding really is. It's fancy. It's intense. It's beautiful. But it is nothing if it isn't personal and human. Make your plans amazing. Work out every perfect detail now. But fill the tables at your wedding with the people you love being with. Surround yourself with guests who'll laugh and make a memory with you no matter HOW your plans work out. Hire vendors like this, too. Hire people you can laugh with. Hire folks who make you feel safe. And then, go do your job. Be just like Sarah in the photo at the top of this page. Be just like these people on your wedding day, from dawn to dusk. Enjoy the dominoes. And it's an awfully good one.